Just posting for anyone interested, I just got this in an email from Agena. QHY seem to be aiming to compete more with ZWO. The decision to pick QHY seems like a no brainer now, given their typically better design including the small form factor for the USB3.0 5III series, and better cooling and dew prevention on the cooled cameras - given the issues people have had with ZWO condensation and frost on sensor, etc. ....not a no brainer for the backfocus-challenged. Am I to believe no one has had condensation issues with QHY? Honest question, I haven’t researched it. If QHY were to work on the camera drivers a bit more they would have a real winner. I find the drivers can be a bit problematic. 2. Lack of a USB hub - Why the weird auto guider port? For me condensation has never been a problem with the newer ZWO camera design. Well I have owned about 10 different QHY (5 cooled) and 3 ZWO (2 cooled) CMOS cameras. All the QHY performed at or above spec for cooling delta and never had condensation, while for the ZWO one performed under spec for cooling and both had condensation and frost issues. Needless to say I'm not a glutton for punishment and that was the end of my experience with ZWO. I've also not seen any other posts about the condensation from anyone else on QHY, though many for ZWO. I wasn't trying to turn this into a ZWO vs QHY debate, that is just my experience. Interesting about the driver issues... I have never had any driver issues personally among all those camera so I guess I'm lucky in the PC hardware I use. I can see how that would be a reason to be wary, as well as backfocus concern. I can save everyone a ton of money by posting what I buy. If I bought it, the price will drop within 6 months. They also have the new prices on OPT, but I looked on High Point and they weren't updated yet. Haven't checked others. Having recently did the native SDK integration of the QHY SDK into NINA, I can say that there were some interesting bugs encountered in the course of doing that. HOWEVER, once I notified QHY of these issues, they were very quick to turn around fixes and, to-date, every issue I've raised with their team has been fixed. Eventually more recent versions of their SDK will find their way into apps and their ASCOM driver, if one uses that. It seems that they're in the closing stages of rewriting parts of their SDK, I suppose to better-support non-Windows OSes (their SDK is now available in macOS, Linux (x86 and ARM), and Android favors.) Doing this while also releasing new hardware (and RPi3-based system) must be keeping their software team busy. 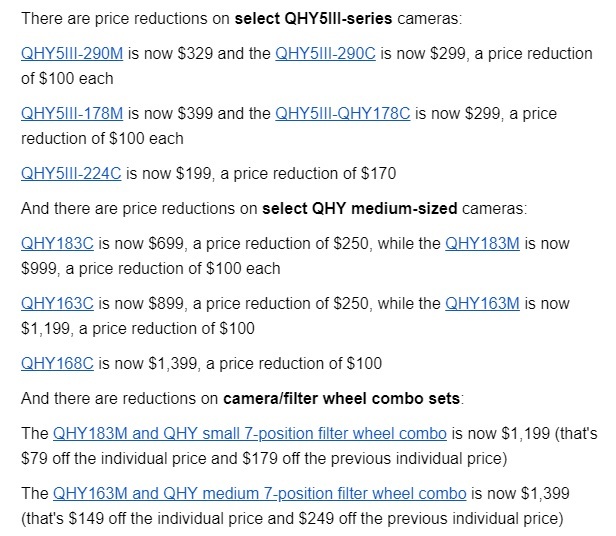 That said, I do like these prices and I'd love to get a cam for myself, but I don't currently have the need for another one other than to use for testing NINA code. Jarrett, Thank you for posting about the price drop. I've been wanting to pickup QHY5III224C. Order placed.